How and why the construction machinery company outperformed all expectations this year. It's not hard to see the overlying reason why Caterpillar Inc. (NYSE:CAT) stock is up nearly 50% in 2017 at the time of this writing. The simple explanation is earnings expectations have more than doubled since the start of its financial year as management raised full-year 2017 adjusted profit per share guidance from $2.90 to $6.25. Here's a look at just how and why this happened. The end result has been that full-year profit per share expectations (including restructuring) have doubled from $2.30 at the start of the financial year to $4.60 even as planned restructuring costs for 2017 have increased from $500 million to $1.3 billion. Whichever way you look at it it's been an outstanding year for Caterpillar. In order to help quantify the impacts of end market improvements here is a chart of where the increase in Caterpillar's end market equipment sales came from in 2017. Caterpillar's equipment sales increased by 13.4% to $30.5 billion in the first nine months. That's an increase of $3.6 billion, and the share of that increase from each segment by region is shown below. Data source: Caterpillar Inc. presentations. Table by author. US Construction Spending data by YCharts. So sales have improved, and as is often the case with highly cyclical companies, an increase in the top-line (revenue) drops through into the bottom line (earnings). Caterpillar is a good example of a cyclical company with good operating leverage. When revenue falls it's usually bad news, but when it increases the turnaround in profits can be dramatic. Focusing on this year, a 12.4% increase in total revenue in the first nine months has translated into a 27% increase in gross profit and an 84% increase in operating income. Going forward analysts expect revenue to expand 8.3% in 2018 with EPS up 22%. However, if Caterpillar's sales expand more than expected then you can expect a larger increase in earnings -- that's exactly what happened in 2017. It's very hard to predict commodity price movements (if you can, then don't bother with equities), so Caterpillar's management can be forgiven if their guidance for equipment sales isn't always entirely accurate. Moreover, it's hard to predict how its dealers will manage their inventory (equipment they buy from Caterpillar) in response to end market conditions. All of which makes it hard to predict Caterpillar's earnings, so when the cycle turns there can be some significant surprises to earnings expectations. Fortunately, this year the surprises have all been on the upside, and that's been helped by management being conservative with guidance. All these factors together have led to analysts consistently raising estimates in 2017 -- good news for the stock. 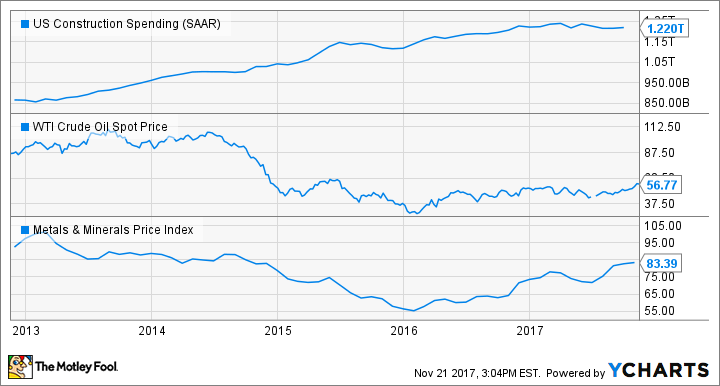 It's hard to know where energy and resources prices will go, but leading indicators of North American construction, such as the Dodge Momentum Index and the Architecture Billings Index, indicate ongoing growth in nonresidential construction. All told, Caterpillar has had a great 2017, but the question is: Can it continue? Caterpillar's ability to leverage sales into profit growth means it's all about the incremental sales it can generate from certain key markets. Right now it's all about oil and gas, China, and North American construction. There's upside potential in Caterpillar's earnings, but it depends on growth in its key end markets. Any weakness in the latter and the stock could suffer.